Even when the region - nowadays the Republic of Liberia - was still called Malagueta Coast, Pepper Coast or Grain Coast, it was known for its secret societies, ritualistic killings and cannibalism. In 'A Dutch Account of the Grain Coast in the Seventeenth Century' Sir Harry Johnston cites Olfert Dapper who wrote one of the most popular books on Africa in the seventeenth century when still little was known of this continent which was increasingly visited by European traders. The Dutch scholar Dapper described African peoples, cultures and conditions on the continent on basis of conversations he had with traders and sailors who had visited the continent. His book, 'Description of Africa', first published in 1668, was reprinted many times. Dapper classifies the Kru people behind Cape Palmas as cannibals, an opinion shared by Sir Harry Johnston who wrote a two-volume book on Liberia in 1906. Johnston also quotes the French traveller Chevalier des Marchais who visited Cape Mesurado in 1724-25 and who wrote that the natives of this part of the Grain Coast were much addicted to human sacrifices (Johnston, 1906: p. 108). Not only the peoples on the Grain Coast had this reputation of cannibalism and human sacrifices. Also in neighbouring Ivory Coast some tribes were known for their ritual practices and cannibalism. In the beginning of the 18th century the Dutch trader Bosman reported that 'all the people to the east of the Cavalla River at this point had their front teeth sharpened to a point, and were very wild.' (Johnston, 1906: p. 92). 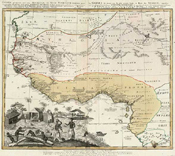 Also a 1743 map depicting West Africa significantly mentions 'Cote de mal gens' - coast of bad people - for the coastal area east of Cape Palmas, which promontory forms today's border between Liberia and Ivory Coast. It is just one of many old maps which contain references to anthropophagic practices of some of the tribes living on this part of the Upper Guinea coast.